Joan's Gardens: This Week's Challenge Card! 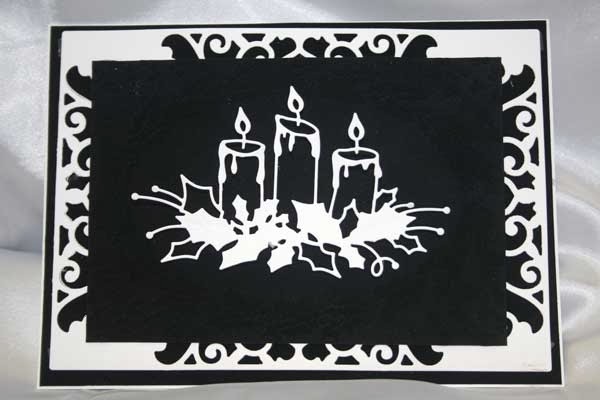 Talk about easy and quick, this elegant black and white card has gotten lots of attention here at Joan's Gardens. It has been a real hit and so beautiful in real life. I don't know if you can see it, but I embossed the black velvet/suede paper first with Nellie Snellen's Christmas Oval 1 Embossing folder before attaching it to the Exquisite Labels Eleven. After gluing the layers, I popped up the Memory Box Candle die. Easy peasy is this week's challenge and I hope you love it. You will have until next Thursday, November 21 morning 6:00 AM EST to link your project. A winner will be chosen from a random drawing for week #46 the winner of the challenge will be announced November 22. The winner will also be entered in the 2013 end of the year $100 gift certificate drawing. Elegant and beautiful!!! What a creative idea to use the velvet!! Hopefully I can do this challenge, my "half" finished one from last week is still sitting here. Elegant card, Joan! 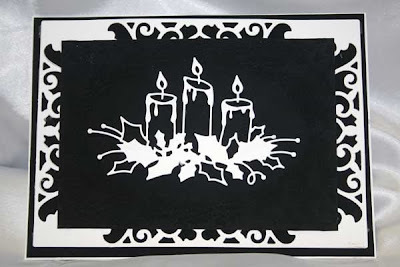 And as I told you...love that candle die! Your card is stunning, Joan! I love the black velvet paper. Can I find it in your store? Beautifully done! Thanks for the easy challenge! What a bittersweet post today... I am happy that you have made a decision that is so good for you. Thank you for the wonderful products and inspiration, and all the best as you enjoy retirement. I can certainly recommend that! Best wishes as we look forward to becoming better acquainted with Terri.